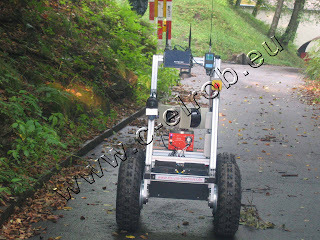 Between 13th and 16th August thirteen teams descended on Monte Ceneri in Ticino, Switzerland, for C-ELROB - the Civilian European Land Robotics Trials. Simply arriving was, in fact, something of a trial for the teams; given the physical size of many of the robots and the amount of supporting equipment and tools, air travel was clearly impossible. Teams therefore drove from the four corners of continental Europe, from as far apart as Portugal, Poland and Finland. For the Finnish lads this meant an epic 3,500km road trip. I was privileged to be able to closely observe the competition, as one of the small team of judges. Although closely involved in robotics research for 15 years this was my first up-close-and-personal experience of outdoor robotics, and my first impression was the sheer difficulty of the physical terrain: robots facing the non-urban challenges in particular had to be able to move and navigate through hilly forest and undergrowth, across rutted and muddy trial paths and, on day two, cope with heavy rain as well. The ‘urban’ challenge of day three was perhaps marginally easier for the robots, but still very tough with steps, ramps and indoor as well as outdoor aspects to negotiate. Some teams were clearly well financed with, for instance impressive 4x4 vehicles fitted with state-of-the-art high performance sensors whereas other teams brought robots that had clearly been hand-built by the students themselves, on a limited budget. My observation was that the well financed teams did not have a significant advantage. The nature of the challenges was such that - provided the robot could cope with the physical demands of the trials - then it was the quality and ingenuity of the autonomous control strategies that was being tested. All four challenges were demanding, but the ultimate trial on day four was undoubtedly the most testing of all. Robots were required to drive around a 3km forest road while spotting, reading and recording the location of the orange markers, with the optional addition of a 2km off-road section. Although tele-operation was allowed within the rules (albeit with a penalty), the hilly terrain meant that maintaining a radio signal between base and robot was more or less impossible. This challenge required no less than full autonomy which - given the difficulty of the mountain roads including no road markings, no clear road edges, deep shadows caused by overhanging trees and hazards like steep drops and hairpin bends - amounted to a significantly harder test than the much feted DARPA grand challenge. Remarkably, the winner of this event - the unassuming University of Hanover robot not much bigger than a wheelchair shown here - completed the course in a little over 40 minutes. Quite apart from the demonstration of the state-of-the-art in outdoor robotics, this event was an extraordinarily valuable experience for the teams who entered. Most of the student teams worked around the clock in their makeshift mini-workshops of clustered laptops to test and refine their robots, right up to the last minute, (one lead professor remarked to me that all he had to do was keep his team supplied with pizza). Modern robots are very complex machines which must closely integrate mechanical and propulsion systems; power and energy management; sensors, vision and navigation; wireless communications and command and control software. The key to success here is systems integration and that integration was reflected not only in the engineering but in the very effective teamwork that was much in evidence at C-ELROB. That teamwork, together with the sense of healthy rivalry between teams, contributed to a remarkably successful event. The full list of teams, and pictures of their robots are here.